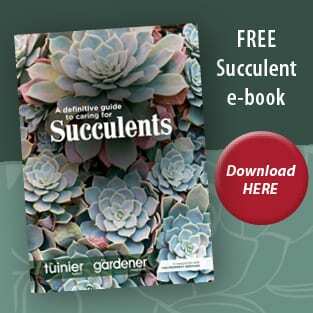 • 3 to 5 medium sized proteas – red proteas and pink proteas will work too. • Turn half of the liriope leaves around so that you have a mix of stem tips and stem ends at each end. Twist the stems into a loop that is slightly smaller in diameter than the width of the vase and drop them into the vase and let go. Don’t try to control this process, simply leave them where they fall. 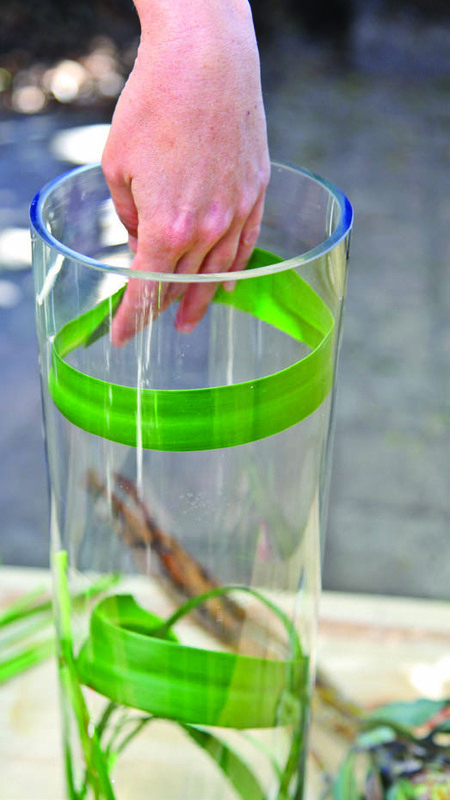 • Make a circle with one of the agapanthus leaves allowing for a 5 cm. Place the first loop in the vase just above the liriope leaves. Repeat this stages so that you have two unclosed rings in the vase which are as close as possible to being equidistant from one another. The last agapanthus leaf will be close to the top of the container. TIP: Cut away any non-flexible part of the agapanthus leaf that you will find close to the base to leave you with a flexible and bendable part of the leaf top and tip that’s to be no shorter than 20 cm. • The first protea will be below the first agapanthus leaf so measure the stem outside of the vase first to get the right height. 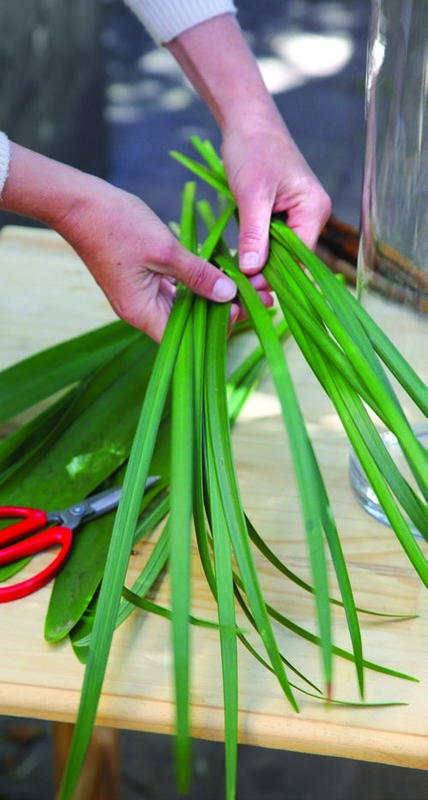 Cut the stem then place it into the vase gently, it should fall amongst the liriope leaves at the base. 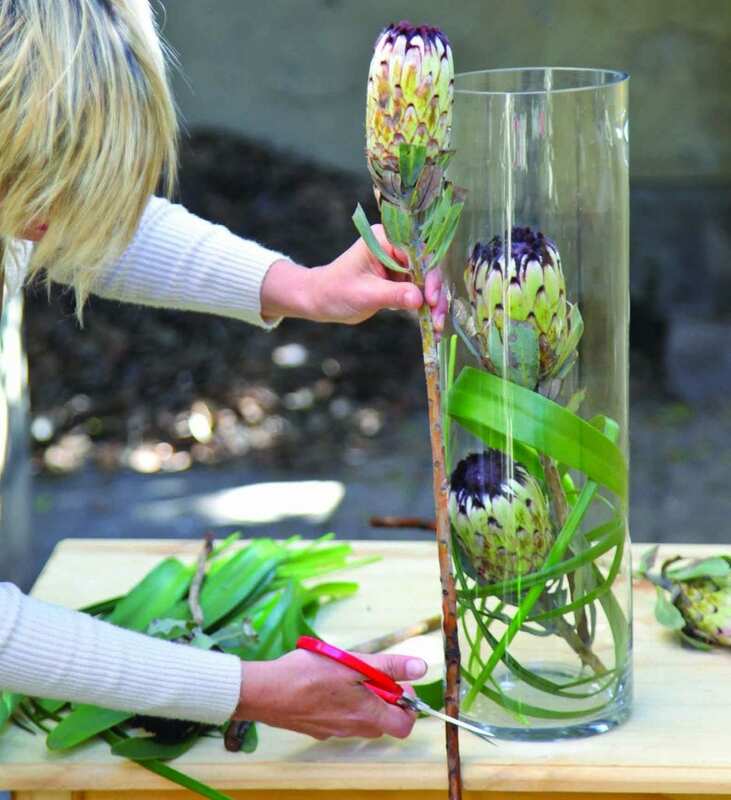 Repeat the same process with a second protea measuring the correct stem length outside of the vase so that the head will occur below the second ring of agapanthus leaf. Turn the head of the protea placed second so that it faces the same way as the first. 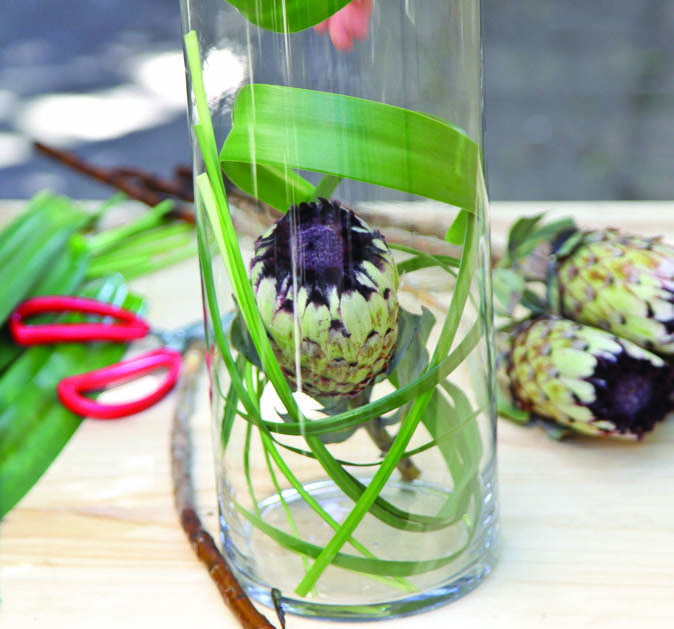 Repeat the same step with the third and longest protea so that falls perfectly into position at the top of the vase protruding slightly out the top. 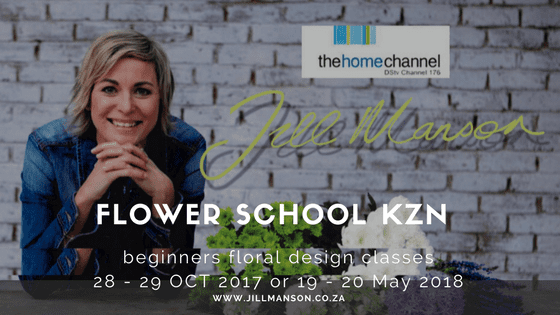 Jill Manson owns and runs the Jill Manson Flower School, where she teaches the art of floristry on all levels from beginner to advanced. She also facilitates flower healing workshops called Flowerscape and delights in the floral styling and supply of fresh flowers for events and weddings.